Today, everyone is talking about M2M (machine-to-machine) and IoT (Internet of Things), the communication between machines. At the heart of the M2M ecosystem is an embedded UICC. As this UICC is embedded, it cannot be physically accessed after integration. Consequently, the testing industry is facing new challenges, such as testing the eUICC itself or in combination with a device, or testing the provisioning process that brings the user profile to the eUICC. COMPRION embraces these challenges. We cooperate closely with GSMA, GlobalPlatform, SIMalliance, and other industry partners to develop future-proof test solutions for the M2M industry. That's why we at COMPRION can offer a portfolio that is perfectly adapted to the market demands. Do you need a test solution for soldered or unsoldered eUICCs? 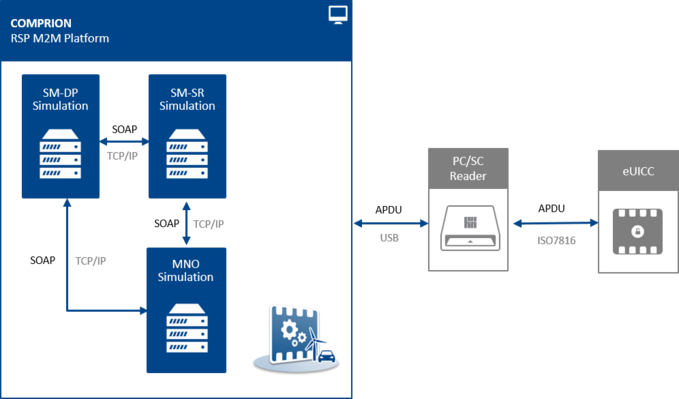 Are you working in the context of compliance or interoperability testing? Or do you have similar but quite individual requirements? We at COMPRION have the right solution! When an unsoldered M2M eUICC shall be tested according to the given industry standards, COMPRION's Connectivity Test Center is the first choice. can be executed using PC/SC reader, Spectro 2, or Spectro TP. 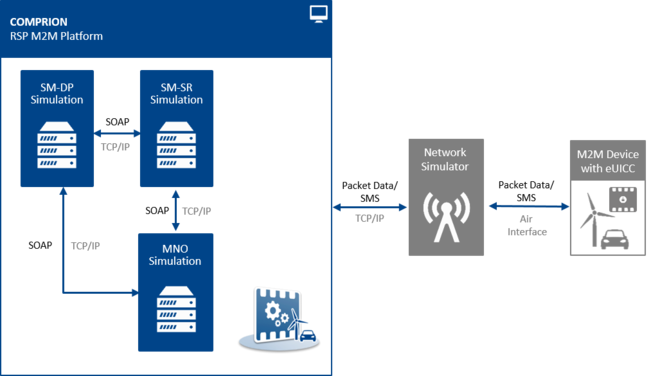 COMPRION Network Bridge can also be used as a stand-alone tool that enables tests including real back-end servers (MNO, SM-DP, SM-SR) without a mobile device, without a real network, and even without any network simulation hardware.